We’ve come to the third installment of this feature, and I think it’s about time for Game Night to visit more of a cult classic than a decades-spanning hit. Lasting for only 21 months between two separate runs, Blockbusters has maintained an audience in syndication success over the two decades since its cancellation. More on the reboot and how it stood up to the original further on down the road, however. 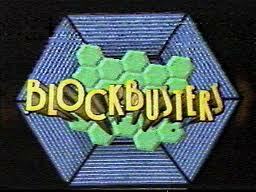 Blockbusters originally started on Oct. 27, 1980 with three contestants and a host. From this first episode to the last less than two years later, the rules of the game did not experience any major overhauls to speak of, though some minor tweaks were employed early on by producers to work out the usual kinks any new game show experiences. These two years found Bill Cullen as master and commander for every episode, with Bob Hilton as his trusty announcer. Cullen, although mostly unknown at this point for his contributions to game show history, was a true legend. Having worked with Goodson and Bill Todman since as early as 1952, Cullen’s calling was clearly as a host, whether it be radio or game shows, and the industry was lucky he fell into hosting gigs early and decided to remain there. Overall, Bill Cullen and his signature thick glasses held the record for most game shows hosted by one person: 23 altogether, of varying popularity and length, during his career. Among them were successes such as Joker’s Wild, Chain Reaction and the primetime slot of $25,000 Pyramid. He even held the honor of being the first host of the original The Price is Right for nine years starting way back in 1956. His achievements, combined with his clear skill set and personality as a host, motivated The Game Show Congress to create the “Bill Cullen Career Achievement Award,” which he himself took home posthumously as the first recipient 14 years after his death from lung cancer in 2004. The week of October 17–21 in 1966—that would make me about 40—was a special celebrity week on Eye Guess. 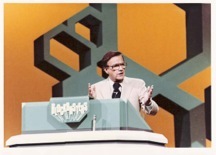 Bill Cullen was the host. The game was very similar to Concentration. I was teamed up with Julia Meade. Remember her? Actress, very pretty young lady, blonde… Okay, never mind. I don’t think I won, but I did get the take-home game. Anyway, the show is over, and I start walking toward the podium to say good night to Bill, to thank him for having me on. He starts coming toward me cross-stage, and I don’t know what he’s doing. His feet are flopping. His hands are flying everywhere. He’s doing this kind of wacky walk-of-the-unfortunates that Jerry Lewis used to do. So I figured, what the hell, I’ll join him. I start doing, I dunno, this multiple-sclerosis walk, flapping my arms and doing the Milton Berle cross legs—my own Jerry Lewis impression… And Julia is whispering, “No! He’s crippled, Mel!” I don’t even hear her. Finally we meet in the middle, we hug, and he says to me, “You know, you’re the only comic who’s ever had the nerve to make fun of my crippled walk. Everyone’s so careful, it makes me feel even worse.” And I realize, Oh, my God, this guy is really crippled! It was my worst moment—and if you weren’t me, probably the funniest thing that ever happened. The fact that Cullen was able to laugh it off and roll with it gives you an idea at how affable and charming he was both on and off camera. Being able to commandeer an entire show from behind a podium or while seated is no easy feat, but the fast-talking dynamo never wavered. Having to work around limitations in the hosting slot wasn’t the only difference between Blockbusters and its contemporaries. Both the rules and the nature of game play stand out as distinct from other game shows in the ’80s. First off, instead of the current norm of two contestants, Blockbusters had three. That’s not so unusual in and of itself; Jeopardy! also featured three contestants competing against each other as singular entities. What made Blockbusters original was to have two related (but unmarried) contestants competing as a team against a third, lone individual. This format gives an air of one-sidedness to the proceedings, like the odds are stacked against the single player. The show specifically formats the rules to counter any unfairness, but viewers initially can’t help but feel the game is unbalanced, which changes the entire mood when watching. By putting an easy underdog into the proceedings, the viewer is naturally drawn towards rooting against the duo, even if only slightly, at the beginning of each episode. Game play starts with all contestants seated behind a table with a four-by-five grid of hexagons in front of them, bordered on the top and bottom with red lighting and on either side with white lighting. Each hexagon in the grid contains a different letter of the alphabet. The object of the game is to form a path of hexagons from one side of the board to the other (either top to bottom or left to right) by answering questions correctly. The competitors take turns choosing a hexagon for which the answer to the corresponding question begins with the letter inside. Whoever buzzes in first and answers correctly, wins the space, which lights up either red or white. This hexagon can no longer be played, and if it is in the path of an opponent trying to connect their blocks must be circumvented. If the answer is wrong, the other side has a chance to answer correctly. If both are wrong, the hexagon stays in play until an answer that begins with that letter can be properly guessed. Connecting a grid by answering questions correctly sounds easy enough, but it is actually harder than it seems. And as mentioned above, the rules ward against the duo running away with the game simply because two heads are better than one: the solo player only has to connect the vertical route of four blocks while the team has to connect the horizontal route of five. This evens the playing field on the question-answering front while also making it easier for the one person to navigate around any blocks the other team may put in their path. Plus, the solo player has more possible paths to take from one end to the other. The winner(s) of each round receive a certain amount of money in their bank (at first this prize was only a trip to the “Gold Run” bonus rounds, but was later altered to a dollar amount). 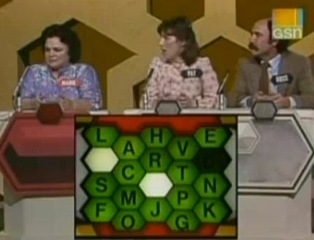 In the bonus round, the questions were harder and the hexes contained multiple letters indicating multiple-word answers. It makes sense that the showrunners wanted the contestants to have to work for the cool five grand waiting for anyone who connected five blocks in 60 seconds. Since a returning contestant could defend their title up to 20 times (raised from eight to 10 and finally 20 over this run of episodes), it was possible to rack up a decent amount of cash just by winning a few final rounds along the way. The episode embedded below shows contestant Leland Yung attempting to add to his already astounding pot of $31,900 against a team that gives him a solid run in the main round. It’s an impressive feat to say the least, and Cullen gives him the proper credit and acknowledgement of his time on the show along the way, as only an astute host can. There was nothing inherently wrong with this format, which makes the changes instituted for the 1987 reboot of Blockbusters at least a little curious. Presumably to enlarge the audience from the original run, NBC altered many aspects, including game play itself. New host Bill Rafferty had only two contestants to watch over this time instead of the more interesting and entertaining three. By removing the two-person team, Blockbusters not only lacked the advantage/disadvantage setup but also the rapport that came with having two family members work together against a random third party. At the same time, watching only two people at once makes the viewer realize how awkward it actually was that in the first rendition of the show one person had to sit there alone with no one to interact with, while the family team were able to congratulate and react to one another. After this change, since neither side was at a kind of disadvantage, a new board was added for the third round. The first two rounds alternated so that each contestant played with the four block path once and the five block path once; if there was a tie at the end of these two rounds, the third and final round was played on a newly created, four-by-four “tiebreaker” board. After so many episodes with only the traditional grid, the four-by-four grid used in the reboot seems almost sacrilegious. Even the fun twist in the Gold Run round—the jackpot now increased by $5,000 every time someone failed to win the big money—could’t truly redeem the rest of the changes enacted by producers. Out of all the tweaks that were made in the five years between Blockbusters incarnations, the changes to the set and to the technology may be some of the worst. In the original show, yes, the walls were that awful ubiquitous mustard color. And yes, there were random hexagons hanging everywhere, giving the viewer the impression that everyone involved was trapped in some sort of giant beehive and the show’s name could have been something extremely cheesy like “Honeycombers.” And yes, if the host changed then it seems justifiable that the rest of the set should change as well as to avoid a direct comparison with the first edition. But the truth is that the set Blockbusters started with was so very, very ‘80s, and the set design they chose five years later looked more like it belonged on the screen of a Game Boy than anywhere near a television program. I could never begrudge a show for attempting to change with the times (coming back with the exact same set would obviously be just as strange), but the manner in which current technology was integrated for these changes was woefully mismanaged. If you pretended that all involved were actually trapped inside a video game instead of just appearing on a game show it would probably be just as entertaining if not more—and there would be a reason for the computer generated flying hexagons in the intro, and for a board that sticks out like a sore thumb instead of meshing into the player podium like the original. These transitions in technology, however awkward, represented a period in the industry when game shows generally began to alter their overall looks to be less homey and more tech-oriented and contemporary. Not every show muffed the landing as badly as “Blockbusters 2: The Busting” when attempting a more modern set, but in this case it’s easy to be thankful that this reboot lasted only a few months. Fortunately, most of the episodes shown in syndication are from the original version and those stand up as quality entertainment 30 years down the road regardless of the level of digitization of the set.